Bands or Artists Who Have "Shot Themselves in the Foot". Larrivee Guitar Forum > Forum > Main Forums > Artists > Bands or Artists Who Have "Shot Themselves in the Foot". 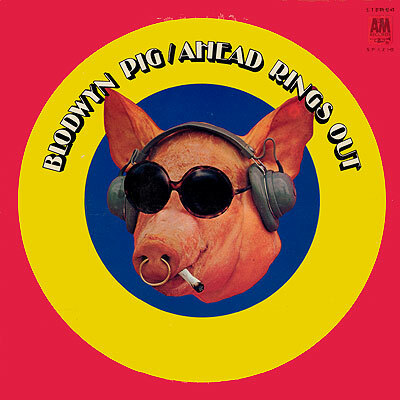 I was listening to Blodwyn Pig today. Great English blues/rock band from the late 60's. Guitarist Mick Abrahams left Jethro Tull after Tull's first album and formed BP. Their first album Ahead (sic) Rings Out is a great blues album from that period. However, I believe if they had have given themselves a more flattering name and a less controversial album cover they may have had a long successful career and be mentioned in the same breath as Cream, Clapton, Fleetwood Mac and the other great British blues bands. Anyone think of any other bands/artists who "shot themselves in the foot" with dumb, albeit perhaps with honest intentions and artistic integrity, career moves. Re: Bands or Artists Who Have "Shot Themselves in the Foot". I don't know right off but that's one hip pig! Sure 'nuff. And one great album! I'm not quite sure I understand that. Actually, I'm pretty sure I don't. At least, the first part. Do I understand that U2 gave away some music and people are upset? Yes - they gave away their last album by having it automatically load into people's iTunes accounts. Many people were upset. I am a huge U2 fan, and really only care for 1 of the songs. Why the anger? Only those who don't have Itune accounts? Could you still buy it in other formats? CD? People that like to bag on U2 and particularly Bono, declared it was a presumptuous move to think that everyone wanted free U2 music. U2 had a pretty funny response to the whole thing. Well, I have to say I don't get it. Can't you delete it if you don't like or want it? Ignore it? Just not play it? Is that the only format it was available in? Anyway, this comes across more like a band that got soot on their face rather than shot themselves in the foot. Dylan when he went electric? Yeah that really hurt his career! 60 years later, he's gone full Rod Stewart! I really hated when the Bee Gees went "disco", but it certainly didn't hurt their careers. I loved their early stuff. "To Love Somebody" is one of my all time favorite songs, and I play it regularly. More to the topic, I think there are certain bands that "shot themselves in the foot", by changing personnel. In some cases, members were "fired" and in other cases, members quit which left them no choice but to find someone else if they were to carry on. The Byrds comes to mind. To me, they were the perfect band with the original line-up and were never as good after that. Or when the rest of CCR insisted on recording some of their own songs? That was the end of a very good band. Have you heard Mardi Gras? CCR is/was one of my favorite bands - still love the fact that Fogarty is out there doing his music with passion and precision. Also, for me, there are a number of artists who I used to love - and they're exceptionally talented - but when they've gone political, for me at least, they've shot themselves in the foot. Same goes for many actors. I don't want to turn this thread in a bad direction, but it is something that has turned me off to a number of artists...I don't buy their stuff anymore, and I've pretty much stopped listening to their music, even when I used to be a big fan. Well, I have to agree. I have nothing against political songs until they become partisan political songs. The first could be art, the second ... propaganda. My main objection is I generally don't want to hear that song over and over again. I got it the first time. Of course, Ohio is a good song but Living With War is not. I agree with you and Ducktrapper. Neil Young comes to mind and Bono come to mind. I don't even mind as much if their songs are political. It's when they attend rally's and preach that irks me.